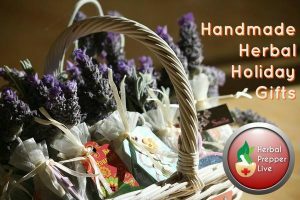 On this episode of Herbal Prepper Live, we’re talking about handmade herbal and natural gifts for the holidays. If you’re like me, you probably shun the stores between the Thanksgiving to Christmas shopping frenzy. 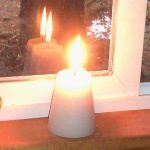 But, I still like to give gifts people will actually want- gifts that make people feel better, gifts that help make the home cozy during the winter, and gifts that help people be more prepared. Listen to this broadcast or download “Handmade Holiday” in player below! Every year, I give some family members a case of food that I have canned. I also do the dehydrated “meal in a jar” gifts. These gifts is particularly helpful to those loved ones who live alone, and have trouble cooking a meal for one. All they have to do is pull a quart jar off the shelf, and dinner is solved. I will share some of the recipes I use that have been favorites over the years. Speaking of favorites, my friends have come to look forward to my herbal gift baskets. They come loaded with soaps, bath salts or bath bombs, lotions, and tea. The men get shaving soap and aftershave or beard balm. Kids love the fizzing bath bombs. Everyone gets some type of bath sachet, from aroma therapy salt soaks to milk and oats. You could make all these in large amounts and give the same thing to everyone. Or, you can make smaller batches, and customize it for that individual. For example, if you know someone with arthritis, perhaps you would give them a bath soak with mustard and rosemary, whereas someone with eczema, you might give them a bath formula with oats and calendula. Christmas if you get started soon. I like to make it with coffee, instead of water, and add coffee and mint essential oils. Put that in a gift basket with some coffee body lotion, coffee face cream, and a bag of gourmet coffee, and you have a gift people will ask for every year. Don’t forget the sweet treats. Herbal baked goods, drinks, and enhanced foods are what make the season. Have someone who loves to cook from scratch? You can give herbal seasoning blends, ginger snaps and candied ginger, vanilla extract, mulled wine.. the list is endless. Will these gifts excite someone like a new xbox? I wish. But, these are gifts that leave lasting memories, that your loved ones can only get from you.